You may have noticed over the past few months that while I have still been active on social media, I haven't been posting anything new in a long time. There have been several reasons for this. Firstly, by the end of 2015 I was starting to feel pretty worn out. 2015 marked quite a big year for me, I moved to Auckland, started my first proper job, started to plan a wedding and in the end also started preparing to build a house. As a result, blogging seemed to be the thing that fell off my to-do list more often than not. During this busy time, while I wasn't strictly unhealthy, I don't think I was taking as good care of myself as I could have. I wasn't eating as many fresh, whole foods, wasn't quite getting enough sleep, not exercising all that often, and living off more caffeine than I usually like to. As people often say, new year, new me, and starting when we got back to Auckland in January (after one final last hurrah cheat day), my fiance Jake and I made the decision to get healthy together. This means being active every day, even if it is just getting out for a walk, ditching the refined sugar and processed foods that had been starting to creep back in, and giving ourselves one treat a week, just for sanity purposes. As part of my new year, new me, I want a blog that is focused on a bit more than food and reflects my lifestyle a little better. I also wanted to inject more of myself into the blog, as at times it felt a little impersonal. The second part that niggled about this blog is its uniqueness. Unfortunately for me, the name Libby, and health food blogging seem to go hand in hand in New Zealand. Off the top of my head I can think of Dr Libby, who often has"real food" in the name of her cook books, and Libby from the blogging duo Julia and Libby. These are both people who I admire and follow, but it does get frustrating that when you search for "Libby's Real Food" along with the name of one of my recipes on google, you are unlikely to find it, as to be honest, both Dr Libby and Julia & Libby are much better at blogging than I am. It is for these reasons that I have decided that I will no longer be creating content for this blog. No, I am not stopping blogging altogether, but with my new direction I wanted a fresh new start. I am not completely leaving my roots behind, as over the next few months I will be going back through the recipes on here and perfecting them for my new blog, The Sweet Tooth Dilemmas. So from this blog I would like to say, thank you everyone for your support, and I hope that you choose to continue to follow me over on my new blog. It has been a busy couple of weeks! Three weeks ago, Hungry Male and I flew down to Dunedin for my Nephew's first birthday. It was really nice being able to go back home and see everyone, since they were all together for the birthday party. We had a Hairy Maclary theme, and my sister made an amazing Hairy Maclary cake! We had a weekend to ourselves and then for the following week we had house guests, as Hungry Male and some friends were taking part in the 90 Mile Classic IRB race. For those of you uneducated in Surf Life Saving language, this was an event where they raced one of the orange surf boats 88km down 90 mile beach, with a couple of transition stages in between. I was the support driver and had to follow them down the beach and make sure their petrol was ready at the transition stages. It was really nice getting to head further north for a weekend, even if it was quite a busy one, as I have never been up that way before and we even had enough time to go to Cape Reinga. Because I was trying to catch up from a hectic weekend, necessity was the mother of invention when it came to lunches, as it was mostly a case of trying to figure something out from what I had in the cupboard and fridge. These eggs were one of my creations. I was actually a little obsessed with eggs this week and I had these on crackers, in salads and on toast. They were really a bit of a life saver. I boiled up a bunch of eggs on Monday night and that did me for almost the rest of the week. Now I haven't quite perfected the easy-to-peel boiled egg yet, so if anyone has any tips please tell me! This batch I added a little baking soda to the water and peeled them under cold water, however, the shell still took a bit of the egg white off with it. 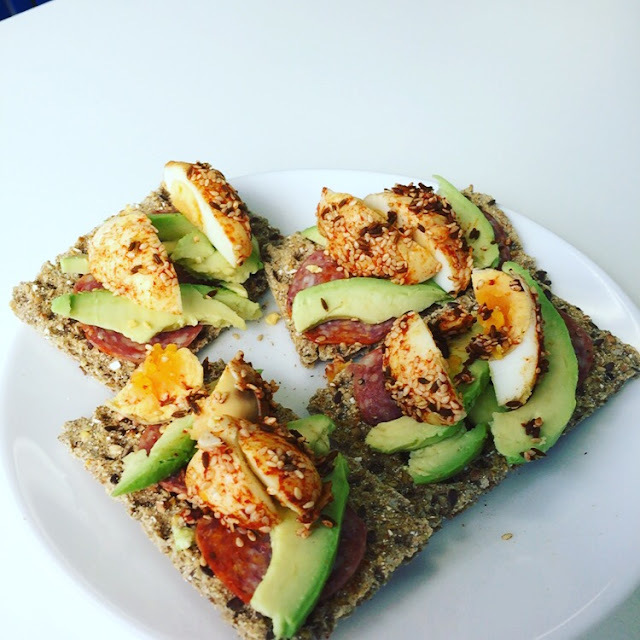 So if you are stuck for lunch or snack inspiration, give these a go! Place the eggs in a saucepan with a pinch of baking soda and bring to the boil. Reduce heat to a gentle boil and boil the eggs for 6 minutes. Remove the saucepan from the heat then put the eggs immediately into cold water. Once the eggs are cool to touch, gently peel them while holding under running water. On a small plate, place the paprika, sesame seeds and cumin seeds. Roll the eggs in the spice mix until well coated. Serve on toast, on crackers or in salads. Aargh! It's been so long since I last did a proper blog post! If you follow me on Facebook or Instagram then you won't be feeling quite so abandoned, but in terms of blog posts I've had a bit of an inspiration block for the last month or so. It's not that I haven't been making and eating any good food, but none of it seemed very blog-worthy. However, I have been doing some inspiration gathering (looking at food blogs seems to help the creative food-juices flow) and I have a list of recipes that I want to work on over the next few months. This recipe is the start. I really enjoy tank food. I know that the dressings are probably full of sugar, but in general they are at least a healthier grab and go option than most other fast food places. In particular, I really like their Raw Energy Salad/ Wraps. This salad is jam-packed full of wholesome ingredients including leafy salad greens, beetroot and quinoa. While I am a foodie, I am also very budget conscious, so while Tank is great, paying $10 or so for a salad just isn't my thing. So i did what I love doing and got in the kitchen to recreate it. Now I haven't had these salads side by side to compare, but I do think that I have got something pretty close and just as delicious. I also really enjoyed making this salad as I got to play with my relatively new food processor and its shredding attachment. This attachment is definitely my new best salad-making friend as it can julienne all of the vegetables I need for several salads in about 30 seconds! I shredded mt carrots and beetroot up on the Sunday and put them in separate glad containers, and then during the week all I had to do was throw together the salad ingredients. A food processor can be quite a costly investment, but I definitely think that you could use a normal grater and still enjoy this salad. Place quinoa in a saucepan and cover with water until it sits about 2cm above the quinoa. Bring to the boil, then simmer for around 10-15 minutes or until water has evaporated and quinoa is cooked. Peel the carrots and beetroot. Using a food processor with a shredder attachment, or if you don't have one a grater, shred the carrots and beetroot. Roughly chop the almonds, or place in a bag and hit with a rolling pin until the almonds are roughly broken up. 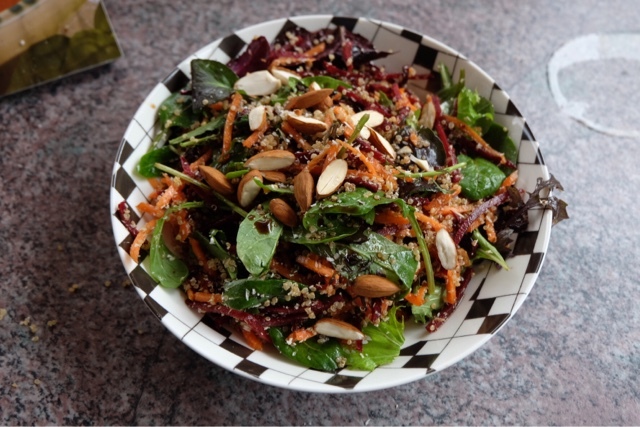 In a large bowl, toss together the salad greens, almonds, coconut, quinoa, beetroot and carrot. In a small bowl, whisk together the oil, balsamic vinegar and honey. Drizzle over the salad and toss. Then sit down and enjoy! Who doesn't love a quick and easy meal? Being able to throw together some ingredients and 15 minutes get to sit down and eat it. A lot of packets spurt their benefits that they can help you make a quick meal, which is often tempting to me. But when I turn them over and find that there are more ingredients in the list than the minutes it takes to make them.... I don't love it so much. Moving to Auckland and starting a 9-5job this year has only made the idea of a 15 minute meal more relevant to me. As much as I love cooking, I also love being able to relax by 7pm. Between getting home and doing dishes, that doesn't leave a heap of time to make a meal. I do love Jamie Oliver's 15 Minute Meals book (although in all fairness, a lot take closer to 25-30 for me), but one issue that I have is that some contain quite a lot of ingredients in them and I am a tad limited on cupboard space. That's why I am always looking for inspiration for simple, delicious meals that are super easy and quick to cook, but which I also know are nourishing and great for me to be eating. You may notice that this recipe uses jarred salsa. Yes, yes, I know that that somewhat breaks my target of no processed foods, however, if you know me you know that I am all about balance, and a little bit of jarred salsa is better than a fraken-food microwave meal or picking up over-processed takeaways. When shopping for salsa, as with all food, I look for the one with the least amount of long-named ingredients. Ideally I would use homemade salsa, which is on my cooking wish list since I've never made it before, so if you have a great recipe let me know! In the mean time I feel comfortable using a little bit of processed ingredient in what is otherwise a fresh and wholesome meal. If you are using 2 large chicken breasts, cut them in 2 horizontally (so you essentially make 4 chicken breasts). Cut two sheets of greaseproof paper, large enough to fit all of the chicken. Place one sheet on a flat surface and sprinkle with the salt, pepper and oregano. Place the chicken on the greaseproof paper, cover with the second sheet, and bash with a rolling pin or similar until chicken is around 1 cm thick. Place a little oil in a frying pan over a medium-high heat. Add the chicken and cook for around 4 minutes on each side until golden and cooked through. Remove chicken from pan into an oven-safe dish. Top each piece of chicken with 1/4 cup of salsa and 1/4 cup cheese. Place under the grill for 2-3 minutes until the cheese is melted and golden. This is great served of rice with a big side of steamed or stir-fried vegetables (as pictured), put into wraps, or used as protein for a salad. Excuse me if this post is a little jumbled, but I have been up since 3am and am starting to feel a little weary. Yes, 3am sounds crazy to me too, but for the next year of my life this will be my regular for a Monday. As part of my graduate programme, I spend one day a week out in the field. This involves being in a supermarket at 4am making sure all of our shelves are well stocked and tidy and that our displays are all set up.... Hence the 3am wake up. With my Monday's spent in a state of sleep deprivation and spending quite a lot of it driving in a car, I need to figure out some great nutritious meals and snacks that are easy to eat in my breaks between stores. Today I did ok, eating a bit of fruit and some sugar-free oat mufifn things, but I definitely think that I could do better. This winter wellness bowl that I made the other week would actually be a great choice. This bowl is packed full of nutrition and uses some great seasonal vegetables. In this I included brussel sprouts and kumara, but it would also be great with pumpkin or butternut squash. The same goes for the chickpeas that I used. I love chickpeas as they really help to fill me up and are a great source of protein, but you could use lentils, kidney beans or some leftover chicken. If you have time, wash the kumara and roast in the oven until soft. If you are short on time, prick the kumara all over with a fork and cook in the microwave for around 6 minutes, turning half way through. Heat a fry pan over a medium heat, add a little coconut oil and then add the brussel sprouts. Stirfry for 3-4 minutes, then add the water and stock. Simmer for a few minutes until the water has evaportaed and the sprouts are soft. Chop the cooked kumara, then assemble all of the ingredients together as nicely or as un-nicely as you like. How horrible has this weather been! Although Auckland hasn't been nearly as cold as down in Dunedin with all of the snowy, freezing weather, it still hasn't been amazing at all!! We've had a lot of rain and some very stormy weather. Hungry Male has been away for the past week, so I have been spending a lot of the cold, wintery nights rugged up in bed with Basil (my cat), catching up on my reading. On Saturday I braved the wet weather and headed into Newmarket to catch up with a friend. We went to Little and Friday which I have been wanting to go to since I got here. I forgot to take a photo, but I had a lemon cake which was delicious! I then went and did a little bit of widow shopping and found a pattern for my wedding dress! That was very exciting. As I was wandering I spied a massage place called The Rub, so I popped in and treated myself to a neck and shoulder massage. I didn't realise just how tight I was until the masseuse got started. It was definitely a nice treat. In the evening, I somehow survived driving in torrential rain with surface flooding on the motorway (aargh!) to go have a Girls night with some friends. We got some chunky chips and pate and breads to start and then shared a margarita pizza, to go with a couple of delicious wines of course. Our favourite was definitely the Kumeu River Pinot Noir (you can buy your own bottle here). Because of the horrible weather, instead of bar-hopping we grabbed a bottle of wine, headed back to the girl's flat and got in our pyjamas to chat. All-in-all it was a fantastic night! On Sunday I used the day to myself to do lots of baking. These crackers were one of the things I made. I love crackers as a snack, but I know that crackers can be a bit of a trap for salt and artificial flavours and additives, so I decided that they were something that I should try and make myself. As usual, I compared a few recipes..... and then came up with my own take. Along with wholemeal flour for fibre, I added almond and pumpkin seeds to up the nutrients in the crackers. I made my a bit thicker, so they are kind of a stodgier cracker rather that a light crispier one. I like this as it means they hold toppings really well, but you could easily make light, crispy ones by just rolling the dough thinner. You can also easily play around with the fillings that you choose to put in your cracker. Preheat oven to 180 degrees C. Lightly grease a baking tray and line with baking paper. In a food processor, whiz your almonds and pumpkin seeds to break them up a bit. Add the flour and salt and whiz together some more. Gradually pour in the olive oil while still whizzing. Little by little add in your water (you may not need it all). Your dough is ready when it has begun to clump together, but isn't sticky. Dust a board with some flour, then roll out your dough until it is about 3mm thick, or if you want nice crispy ones, roll it thinner. Cut into squares or rectangles and place on the baking tray. Take any dough offcuts, roll in a ball and then repeat. Brush your crackers with a little olive or coconut oil and sprinkle with seas salt and herbs. For thick crackers bake for around 18-20 minutes. Crackers should feel hard and be golden on top. For thin crackers, they will only need around 10-12 minutes. These will be golden and feel crsipy. Leave to cool, then enjoy. It is easy going to the supermarket and buying healthy ingredients. You walk in and you grab all of the items that are whole foods. You stock up on lots of fresh fruit and vegetables (preferably ones in season). You go to the chillers and buy your milk, butter, cheese etc. Wander past the bakery and then head into the aisles. However, eating real, nutritious food on a day-to-day basis is not so easy. I often find myself getting all enthusiastic at the supermarket, coming home with lots of great, nutritious food and then......... blank. I have no idea how to use alot of it. One of my friends has requested that I make up a meal plan with a shopping list that would essentially eliminate this problem. While I don't yet have one of those ready, I thought instead that I could try to inspire you a little with how I turn my weekly shop into real food. Celery: I love celery as a snack. Dip it in some hummus or fill it with cottage cheese and raisins or peanut butter (my personal favourite is obviously peanut butter). Beetroot: You may or may not know, but beetroot is really delicious raw as well as cooked. I love to grate raw beetroot, mix it with balsamic vinegar and salt and serves it with other salad ingredients. You can also roast your beetroot up with other vegetables for roast vege salads or a side dish. Avocado: I absolutely love avocado!Mash it up for guacamole, throw it in a smoothie, eat it on its own coated in Dukkah or drizzled with lemon juice. You have no reason to throw out avocado! Apples: I eat apples every day. Often as is, but I also chop it up with yoghurt for breakfast, dip them in peanut butter for a snack, or cook in the microwave with some cinnamon as a healthy treat. Carrots: Another favourite of mine. I use carrots in stir fries and casseroles, throw them into salads, grate them and stir them into mince meals, or simply eat them raw as a snack. Next up we have meat and dairy. I used to be the sort of person who only ate low-fat dairy, but I gave up on that over a year ago, and to be honest, I don't think it's made one scrap of difference weight wise. I also get lots of benefits from it like making me feel fuller. In this shop I had chicken, mince, steak, ham, milk, sour cream, greek yoghurt, yoghurt pots, and feta. 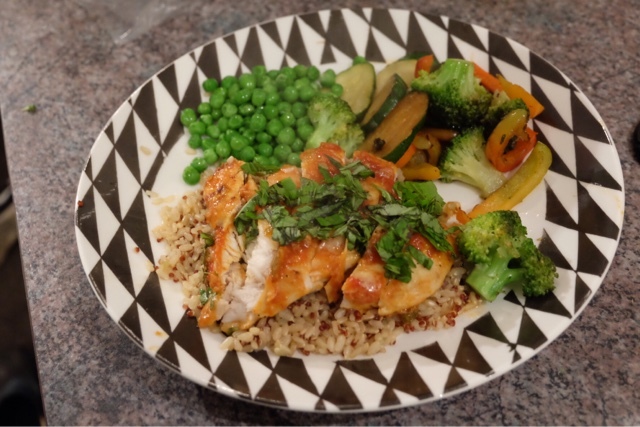 Chicken: This is a weekly staple for me. Sometimes I pre-stuff it in the weekend, so I have an easy throw in the oven weeknight meal. I also love it in stir fries, in pasta, marinated and grilled. It is a really great base for your "real" meals. Mince: I tend to go for a premium mince as I just don't really like the taste and texture of the fattier mince. With mince I make slow-cooker meatballs, mexican style mince to top baked potatoes or in wholegrain tortillas, or cook it up traditional bolognaise-style. Steak: I'm pretty uninventive. I tend to rub it down with a little oil, pepper, salt and smoked paprika and then grill it. Ham: I don't eat a lot of processed meats, but sometimes ham comes in handy for on pizzas or for in sandwiches. Sour Cream: Mexican-style food needs sour cream! Again, I don't use it heaps, but it's the sort of thing that is handy to have in the fridge. Greek yoghurt: Plain, full-fat greek yoghurt is a staple for me!! I often have it for breakfast with fruit and oats, I stir it into my porridge, I eat it with nuts and fruit as a snack, or I use it in baking. I just really love my greek yoghurt. Collective Yoghurt Pots: If you follow me on social media, you will know that I really love The Collective products. They tend to be low in refined sugars and these ones also had grains in them. These were used for my mid-afternoon snacks. Feta: Feta is great to add a bit of flavour to things and a little goes a long way. I crumble it over salads, over vegetables, smush some into a sandwich, or make a delicious spanakopita (Spinach and feta filo roll). And finally we have all of my other cupboard staples. This included tinned tomatoes, beans, peanut butter, spices, tomato paste, muesli bars, pasta and a quinoa-rice blend. Tinned vegetables: I always keep some beans or chickpeas in my cupboard so that I can add them to my lunch salads for protein, or use them in casseroles or soups. I also use tinned tomatoes lots for pasta sauces or other tomato-based sauces. Muesli bars: These are processed so I don't eat them alot. These particular ones were for hungry male who tends to be a bit fussy, but when I buy ones for myself, I buy ones with as few ingredients as possible and with a small amount of refined sugar. So that is the most of it. I'm not going to pretend like I am perfect and never touch processed foods, but I find that if I do some pre-planning before I shop then it is much easier to stick to eating and using up my real-food shop (because I really hate wasting food!). Hope this inspires you to get into the kitchen and make some great real-food meals. Hi my name is Libby and I am a Real Food Foodie from Dunedin, New Zealand. This blog is where I share delicious recipes with you, most of which have a real food focus. Have a look around, drool a little, then get into the kitchen!! !